We work so hard to keep the inside of our homes beautiful, well-maintained, and functional. But that doesn’t mean we can just ignore the exterior. Keep in mind that if you’re looking to sell your home, it’s the outside that potential buyers will see first. As explained in this article from Fox News, the look of your exterior begins with siding. 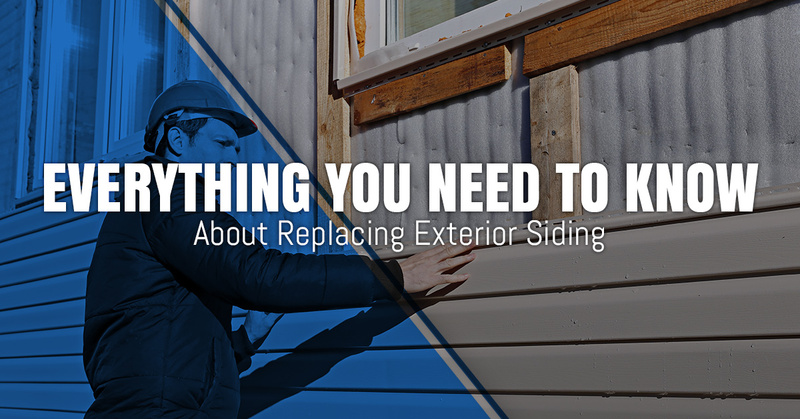 In this blog post, we will look at the ins and outs when it comes to siding replacement. Homeowners choose to update their siding because they either want to change the look of their home or replace the damage/deterioration to existing siding. Just like the roof, exterior siding is exposed to the elements on a daily basis. That’s important to know for Colorado homeowners, where we deal with extreme weather throughout the year. The scorching heat and damage from storms can really take a toll on siding. Let’s say that your siding is damaged in just one spot and you only want to replace that area. It sounds easy, right? However, the majority of home remodelers and contractors don’t do patchwork because it’s a liability. Not to mention, it’s anything but easy to match any existing siding due to fading and availability of the product. Siding companies recommend that if you do have some damage to your siding and it’s not causing leaks, it’s best to just wait so you can replace all the siding on your home. There are a variety of materials used for siding installation. As with any major home improvement project, you want to research the pros and cons of each before reaching out to a local home remodeler. At MC Home Services, we only deal with real wood siding. For one, it looks beautiful and is easy to replace down the road. Many homeowners boast a wealth of home improvement skills. But siding installation isn’t exactly the typical DIY project. Siding professionals will say that only about 1 to 2 percent of people can perform siding installation on their own. Keep in mind, also, that installing certain products incorrectly can void the warranty. Before getting started with your siding project, it’s a good idea to check with your homeowner’s association if you have one. You will want to know if they prohibit certain colors and materials. Permit requirements are unique to every city, town, and neighborhood. The majority of contractors will pull the permit, though it’s the homeowner’s responsibility to pay the cost. Siding contractors tend to be busiest during the warmer months. With another Colorado winter looming, get in touch with us as quickly as possible if you’re in need of siding replacement. Not all of us have the time or skills to complete home improvement projects such as siding installation. That’s where Matt of MC Home Services can help. For years, he’s been performing and managing remodeling, carpentry, full renovations, decorating, and other work in Northern Colorado. Matt understands that every project, regardless of size, deserves the utmost attention to details. It’s no question that home improvement takes a team of qualified professionals to get the job done. With that said, very rarely is there cohesiveness amongst a large group of contractors working on the same project. MC Home Services is different in this regard. Through the years, Matt has worked hard to develop a small network of reliable contractors that share his same principles of communication, reliability, and trust. While we definitely excel at many tasks, we allow our team members to perform the task they do best. When everything comes together, in the end, homeowners see the difference. It doesn’t take long for clients to realize that we aren’t just out to provide home improvement services. We genuinely care about homeowners and enjoy nothing more than finishing a job the right way. Our team takes pride in our approach, methodology, and workflow planning. From setting up a workstation effectively to the final finish work and detailed cleanup, everything we do has a purpose. If your siding can use an upgrade, give MC Home Services a call.